Last year’s movie, The Bucket List focused attention on lists of things we want to do before we die. I’ve long had a list of places and events I want to visit and so far I’ve been doing a pretty good job of tearing through that list. I’ve been to Munich’s Oktoberfest, I’ve walked the Great Wall, I’ve seen the Great Pyramids at Giza but until today I’ve never been to Spring Training. Of course I’m talking about Cubs Spring Training. 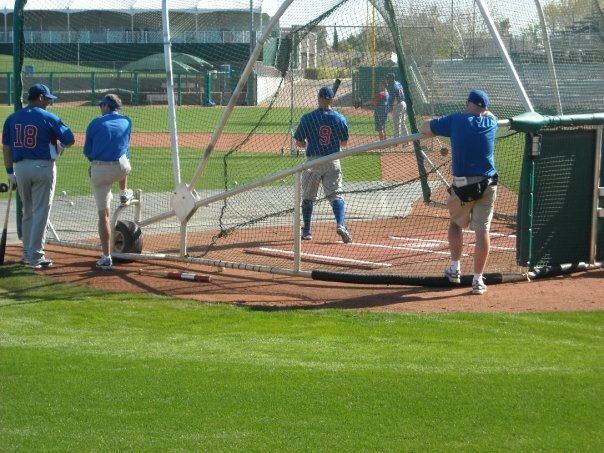 The Phoenix paper and a couple of blogs I read all said that today (Feb 24) the Cubs were going to play an intrasquad game. I even called their office in Mesa and the woman I talked to, said that they were playing a game and the doors would open at 9 and the game would begin at 9:30. AM that is. So I set my alarm and left my hotel at 8:30 for the 15-minute drive to the ballpark. The crowd at that hour of the morning was surprisingly sparse. I was third in line, guaranteed a front row seat. Of course they didn’t let us in at 9:00. It is, after all, the southwest. That gave the radio guy time to accost me. I saw him working his way through the crowd (which had grown to about 100 people). He was looking for somebody who was actually from Chicago. I guess these practices attract mostly locals. I did volunteer that up until two and a half years ago I was a full-fledged Chicagoan and Cub Fan. I’m still a Cub Fan—just a Cub Fan from New Mexico now. He wanted me to sing a chorus of Go Cubs Go. I told him I’d do better than that and whipped out my Iphone to play it for him since Steve Goodman sounds a lot better than me with a hoarse throat. BTW, I have it as a ringtone. When they let us in, I grabbed a roster sheet and found a primo seat…right between where the screen behind home plate ends and the dugout begins. The third base dugout which is the Cubs dugout, right? Wrong! It soon became clear that they were using the first base dugout and the real primo seats were on the first base side as the team was running their sprints in right field. It didn’t matter, though because I had a good view of the batting practice and that was the highlight since somewhere along the line they decided not to play the intrasquad game. So the coaches came around first and I gotta tell you, Alan Trammel and Ivan DeJesus still have it. They were hitting grounders and fly balls so the players could do their fielding exercises. And the players looked good. Fontenot and Theriot were grabbing everything that came to them and Felix Pie was catching those fly balls. 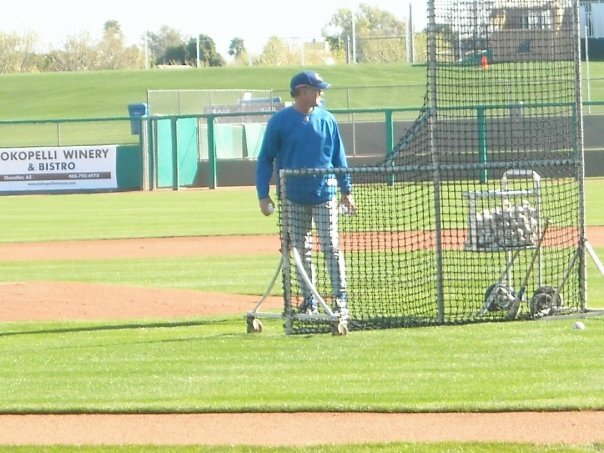 And then I looked at the guy pitching the batting practice and it was Ryne Sandberg. Excuse me for being a fan, but it was friggin’ Ryne Sandberg right there on the pitchers’ mound. How exciting was that? I should take a moment to talk about how great it felt to sit out in the sunshine and watch some form of baseball. I know how grim the winter has been in Chicago so I’m not rubbing it in when I say it was a flawless blue sky and the temperature was in the eighties. It felt like summer and baseball. 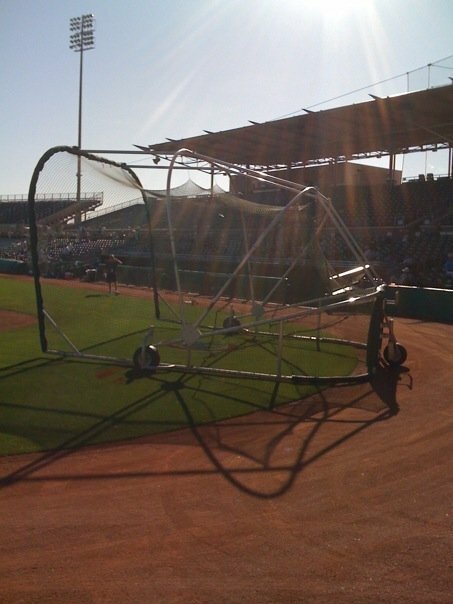 About that time, I was joined in my semi-primo seats by two guys who spend the winter being neighbors in Mesa. Lou was from Galesburg, IL and was a Cubs fan and Al was from Idaho. Lou converted him to be a Cubs fan. I pointed out Ryno on the field and they were excited as well. Then it was time for the players to bat and they did so in groups. The first group was Geovany Soto, Derrick Lee and Reed Johnson and they were knocking Ryno’s pitches out of the park. Then he let Alan Trammel pitch to Theriot, Fontenot, Paul Bako and Felix Pie. Or at least I thought it was Felix Pie. Pie was one of my favorites last year being bounced up and down from the minors like a yoyo. A bit of a head case, I heard but I didn’t care. I liked him because his name was spelled P-I-E and hey, who doesn’t like pie? I didn’t know he’d been traded. Las Cruces NM is a little far out of the Cubs loop unless you’re reading the internet daily and I was just too busy in January to take notice. Sure there was that inauguration thing and the economy collapsing and my business failing and all but that’s no excuse. I should have known about Felix Pie. I’m hurt that they gave his number away so quickly. Pie wore number 20 in the proud tradition of Adolfo Phillips, Al Spangler and Thad Bosley. Now it belongs to Luis Rivas. Next thing you’re going to tell me is that Ron Santo didn’t make the hall of fame again. Lou Pinella had been standing in right field checking out his players until he decided to stroll over to the batting cage to get a better look. I didn’t hear him offering a lot of advice though. He was mostly talking with non-players. Maybe the press. Speaking of the press, this was about the time the second radio guy came to interview me. He was an old guy from a right wing talk station in Phoenix. When I told him I hadn’t heard of his station he proudly told me it was the home of Rush Limbaugh and Bill O’Reilly’s radio shows. Of course I wouldn’t have heard of it. He wanted to know how I was enjoying the game so I told him I was making my friends in Chicago jealous by taking pictures and uploading them to Facebook. He had no idea what I was talking about. Players I didn’t see were Fukodome (is he even still with the team? ), Aramis Ramirez (Al and Lou said he was out there yesterday) and Milton Bradley (same thing…yesterday) and no pitchers. I was hoping to get a look at Ryan Dempster and not just his pitching arm. After batting practice they ran a few more sprints and then went inside. Reed Johnson and Luis Rivas (not so proud new wearer of number 20) stayed behind to sign autographs by the right field wall. There is a cry among spring training enthusiasts if a player is spotted giving autographs. You’re supposed to yell, “signing” and point to where they are. Lou (the one that was sitting next to me, not Pinella) jogged over to get the autograph. Al and I were sort of hanging out waiting to see if they were going to play the game. As much as I wanted to see a game I knew I really had to get on the road since I had a 5 and a half hour drive ahead of me. So I checked with one of the officials who confirmed that there would be no intrasquad game. So I said goodbye to Al and a slightly out of breath Lou and headed for home in Las Cruces. Thanks to Karen for the report!